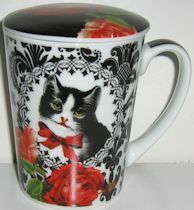 This beautiful porcelain mug is decorated with the image of a tuxedo cat from Paris (chat Parisien). The mug comes with its own lid. The cat mug is 4" high x 3 1/4" wide (not including the handle). Use the lid to keep beverages warm. The mug comes in its own decorative box. Made in Germany, the mug is dishwasher and microwave safe. Note: photo shows the mug with the lid on.